In Dr. Seuss’s story about the Sneetches, birds with plain bellies are shunned by birds with stars on their bellies. A stranger comes to town and offers the “plain-bellies” a chance to be just like the “star-bellies” by taking a trip through his Star-On Machine. The newly-starred Sneetches are then happy, but the naturally-starred Sneetches are mad that they lost their elite status. The stranger produces a Star-Off Machine and the naturally-starred Sneetches have their stars removed, but then are followed by the newly-starred. All the Sneetches make multiple trips through both machines until they have spent all their money and none of the Sneetches can remember who was previously a star-belly and who was previously a plain-belly. The stranger packs his machines and drives off with all the Sneetches’ money. The Sneetches, not remembering each other’s status, stop worrying about stars and begin to all come together in a society free of discrimination. Inspired by this terrific story, I decided to make the Sneetches and their machines for my young boys. Most of the materials and tools I used are easy to find. Others aren’t as obvious. For this and many other projects, I use a great IR emitter circuit from David Cook’s Robot Room site. Atmel ATTiny85 microcontrollers and yellow Sintra sheets are available from Solarbotics. To program ATTiny85 chips, I use Adafruit’s USBtinyISP. 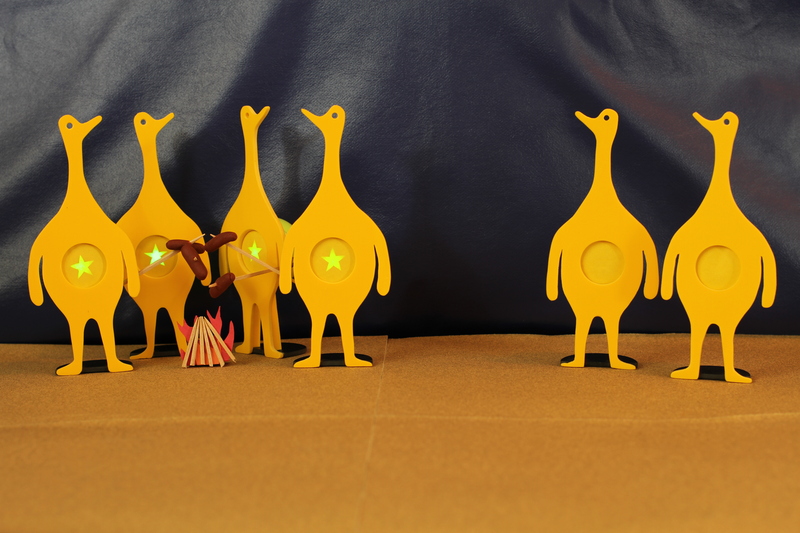 Using the same infrared control scheme, a working set of Sneetches and machines can be made many different ways. In the exploratory experimentation phase of this project, I even used a bare cardboard mailing tube to test the feasibility of the IR control scheme. When making your own machines and Sneetches, don’t feel compelled to make perfect replicas of mine or Dr. Seuss’s. Just get as close as you want using materials and construction methods within your budget and timeframe. Do try to learn a few new things, though. Have fun making!